"Managing Mobile ESI: What it is, and what it means for your company"
Managing electronically stored information on mobile devices is becoming critical for organizations as employees routinely use their personal mobile devices to work either during or after their official workday that may ultimately prove to be discoverable evidence in an event of litigation. Where is ESI located within the organization and what are the implications of this electronically stored information? How to Identifying the information that is most relevant for litigation needs? What are the important aspects of electronic data and how it should be managed? Organizations face a number of challenges in reviewing the mobile ESI at the time when it matters the most, so companies should have a plan in place before any litigation arises that can allow them to both identify and preserve potentially relevant mobile ESI. 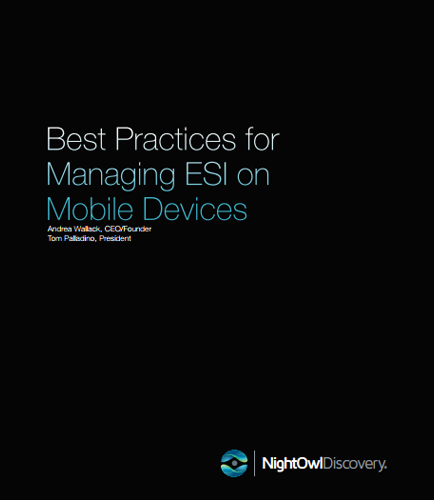 • Managing Mobile ESI: What it is, and what it means for your company. • Maintaining Control: Corporate Policies that govern private mobile device use. • Identification and Collection: Accessing ESI from mobile device.